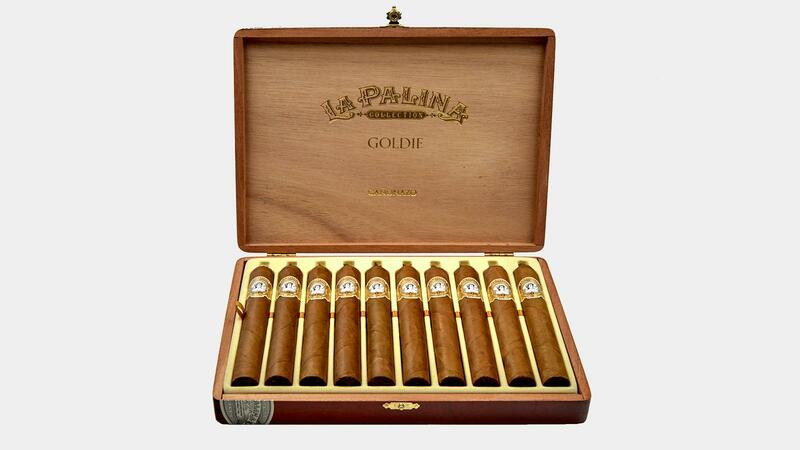 The first shipment of the La Palina’s annual limited-edition Goldie release is now heading to stores. Fans looking to get their hands on a box or stick, however, will have to find their closest Tobacconist Association of America retail member, as the first boxes will be sold exclusively through TAA participants. The new 2018 La Palina Goldie is called Cañanazo, and it measures 5 7/8 inches by 52 ring gauge and retails for $22. Like the previous six releases of Goldie, this year’s Cañanazo is finished with a wide, flag-style cap. The Cañanazo is rolled with a golden-brown wrapper grown in Ecuador, with Ecuadoran binder and filler tobaccos from Nicaragua and the Dominican Republic. According to La Palina, the blend also includes a small amount of medio tiempo leaf from Nicaragua. Only 300 boxes are being shipped right now to TAA retailers. Each box is individually numbered and holds 10 cigars, which are packed in individual compartments. La Palina says that 1,200 more boxes will ship to other retailers this Friday, for a total of 1,500 boxes. Like all Goldies, the 2018 Cañanazo was rolled at Miami’s El Titan de Bronze Factory by only one roller. Click here to view ratings on past La Palina Goldies.